Mondays have become my day off lately. Hence, I usually loaf around the house or--when the stars are properly aligned--work in the yard. It's only when supper time rolls around that I get all dappered and take the family to, yes, Chick Fil A. When I look over this ensemble, I kind of think it's overdone. It was well-intentioned, but it's really just too busy. 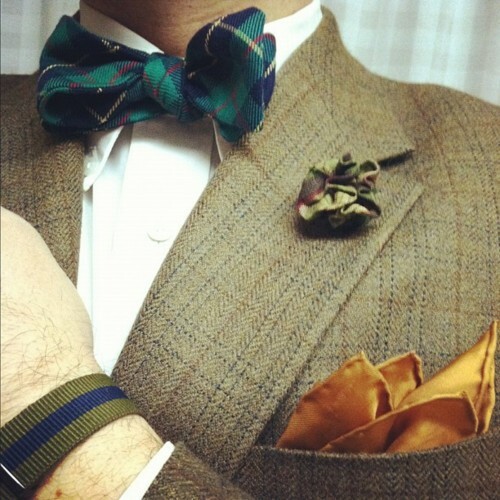 Different plaids on the bow tie and lapel flower: not a great idea. Especially when considering the jacket is patterned, too. The blues aren't exactly complementary, and neither are the greens. The rust silk pocket square is just too pushy and doesn't coordinate well. And of course, it's too much for Chick Fil A.
Oh well--you win some, you lose some. But still. The bow tie itself is fantastic. It's a narrow (even narrower, by 1/8'', than our normal "narrow cut") butterfly tartan. We used to sell it in our store, but it's long been sold out. Ellie happened upon some leftover fabric and did it up for me. Go and get you it. What I think does succeed, however, in this outfit, is the silk repp striped D-ring belt with the jeans. It's a Polo Ralph Lauren from the local consignment store.